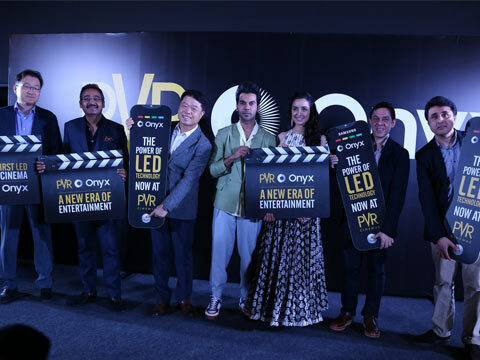 PVR Cinemas, India’slargest film exhibition company, with Samsung, India’s most trusted consumer electronics brand and the leader in display technology, today announced the launch of Onyx Cinema LED. With this new display technology, movie lovers can now watch the movies with unparalleled picture quality, true colours, andgreater vibrancy and accuracy, exactly how the director intended it to be seen. Film projectors have been the medium of cinema display for over 120 years now. This next-generation innovation is all set to end this old method and will change the way we watch movies at a Cinema Hall and will mark a new chapter in the history of cinema viewing technology.The screen will now be playing shows at PVR Icon, Vasant Kunj, New Delhi. The unveiling of PVR Onyx Cinema LED screen was conducted in the presence of Mr. HC Hong, President and CEO, Samsung Southwest Asia and Mr. Sanjeev Bijli, Joint Managing Director, PVR Ltd.
“Samsung has always been at the forefront of meaningful innovations and we are delighted to launch Onyx LED Cinema screens in India. The screen is now up and running at PVR Icon, Vasant Kunj. We are the first Cinema exhibition chain in the country, to introduce this disruptive theatre technology for Indian movie-goers,” said Sanjeev Kumar Bijli, Joint Managing Director, PVR Limited. “We are committed to deliver world class standards of cinematic experience to our patrons and this association is another step in this direction,” he added. “India is a film loving country. Our movies are full of vibrant colours and rich music. Onyx Cinema LED will bethe true solution for such content and we believe this technology will be a ‘Blockbuster’ in the film industry. It is going to revolutionize the movie viewing experience of the movie lovers,” said Puneet Sethi, Vice President, Consumer Electronics Enterprise Business, Samsung India. “This screen is one of first few screens launched worldwide by Samsung and we are thrilled to partner with one of India’s biggest film entertainment company, PVR Cinemas to bring in this game changing technology for the movie lovers,” he added. Over the past few years, movie theatres have been seeing a huge spurt in numbers. Advanced theatre technology is on a growth gradient. With increasing interest in the technology among movie experts and enthusiasts, Samsung launched the innovative Onyx Cinema LED, a move away from the projection systems that were existing hitherto. The Onyx Cinema LED has the potential to deliver unparalleled picture quality, bringing content to life with greater vibrancy and accuracy. It comes with an array of solutions including the Onyx VIEW, Onyx 3D and Onyx SOUND, providing a uniquely immersive experience.This comprehensive screen and sound solution for movie theatresis poised to revolutionise cinematic experience for every movie enthusiast, whether you are a movie buff, a sports fan, or a fence sitter.